ALL NATURAL. 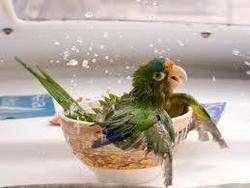 Help your bird groom it's feathers with Ruffled Feathers Bird Bath & Feather Groom. This gentle formula contains natural based enzymes which penetrates your bird's feathers to clean and revitalize. It also benefits by keeping natural oil glands open. Soil and odors are removed leaving silky, shiny feathers. ALL NATURAL. Ruffled Feathers Bird Mite and Lice Spray is made with natural cinnamon oil to kill lice and mite on all birds. Fast acting gel stops bleeding fast ? stops pain and disinfects too. New easy-to-use syringe applicator. Super Clot? halts bleeding that is associated with minor cuts, surgical wounds, nail trimming, etc. It comes in an easy to use syringe that provides controlled and accurate application. Super Clot? is used in place of styptic powders and pencils that don?t have its disinfecting and numbing properties nor its ease of use. Lixit Quick Lock Bird Bath is made with an all plastic heavy construction bird bath. Ideal for lovebirds, canaries, finches, parakeets, cockatiels and other small to medium sized birds. Fits all wire cages and Installs in seconds. Easy twist on-off. Size 3in high x 5in across. Comes with screw and wing nut for attachment to cage.